It was another hot and humid day on Royal Street. With institute reporter Glynn Hill, I was assigned to photograph people in bars in the French Quarter for reaction to the announcement of the “rightful” Super Bowl 2018 location. The search had started to pick up when I spotted two people walking down the street in Stormtrooper costumes pretending to shoot people with their blaster rifles. 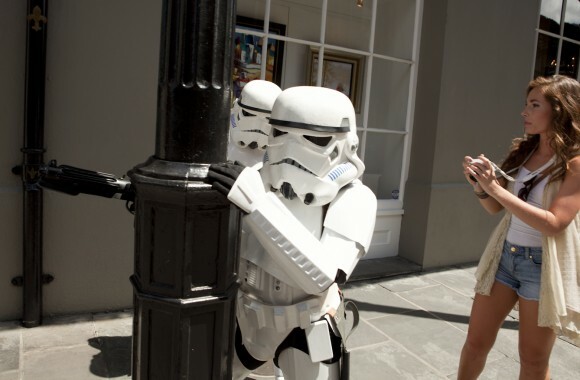 The French Quarter isn’t immune to oddities, but it was a first for me to see people brave enough to cover themselves in “Star Wars” outfits in the hot sun. This changed the course of my mission. I saw my targets. The battle to see who would shoot the other first commenced. 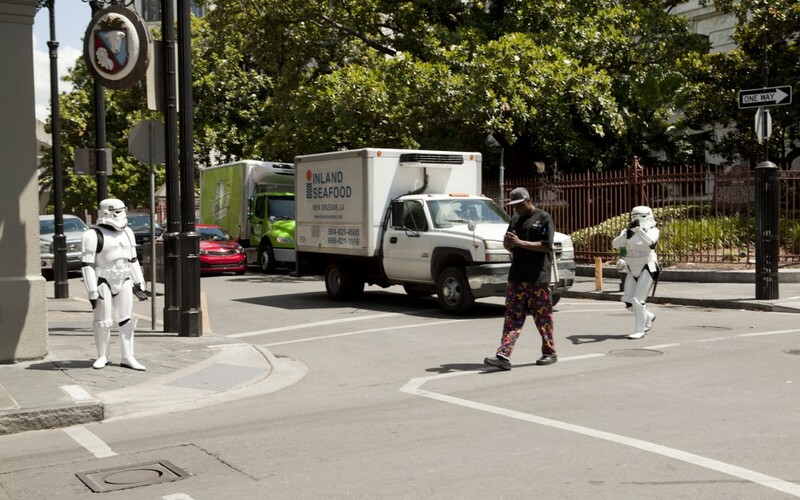 I got my photograph but not the identities of the Stormtroopers or why they were in the costumes in the first place. As a person in battle, however, you don’t give up until you complete your mission. I waited in Jackson Square with Glynn, and to our luck, we found them posing with people for a selfie. They were Mike Burton, 44, and Lila Wilson, 49, a couple who live in New Orleans. It might have appeared that they were trying to make a quick buck, but they said they were wearing the costumes to bring smiles to people’s faces. A good mission indeed to initiate on a hot New Orleans day. And so Glynn and I departed in high spirits, knowing a little bit more of the kindness that spreads in the Big Easy.